Fascia is a vital and abundant layer of tissue in the body. It's main job is to maintain the shape of our body. Working directly on these tissues impacts our overall body shape and posture. Also, most Trigger Points are found within the fascial layer, and releasing the fascia can release the Trigger Points. ​I specialize in indirect myofascial release, a gentle holding technique that can impact all layers of tissue, down to the bone, with no pain. You will be amazed at how effective this technique can be! Craniosacral therapy involves gentle holding techniques that help normalize the movement of cerebro-spinal fluid through the body. This movement can be assessed for dysfunction and subtle techniques can restore flow of this vital fluid through the system. Biodynamic Cranial work is a specialized form of this therapy that focuses on deep connection - between the therapist and client, and also to deep stillness. This kind of cranial therapy can have far reaching effects in the body. It is gentle, pain-free, and wildly effective. That's why it qualifies as one of my favorite techniques. This work causes deep relaxation in the client and promotes a restful stillness that creates the perfect environment to facilitate deep changes in the client. Visceral Manipulation involves working directly with the organs of the body to not only improve function of the organ itself but also to relieve associated musculoskeletal restrictions. The best form of this technique that I've found is taught by the Barral Institute, founded by French Osteopath Jean Pierre Barral. 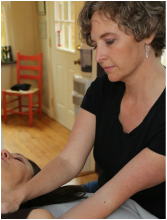 Barral's desire is to bring a gentler form of Osteopathy to the world and this technique fits perfectly with my bodywork philosophy -- work with the body, help it come into balance, and then it will do the releasing that it needs to do almost effortlessly! This technique involves gentle assessment techniques to "listen" to your body and find where the area of greatest restriction is located. Once located, a trained and sensitive palpating hand interacts with the restricted organ in assist in releasing those restrictions. Clients report increased harmony in their digestive systems, extreme relaxation during the work, feeling more open, and reduced stress in their organ system. I've seen the organ release work even out a high hip/short leg, reduce muscle spasms in the low back and shoulders, and improve gait and posture very quickly. ​MET's are great techniques to quickly and easily reduce pain and increase range of motion and flexibility. Gentle assisted stretches with slight resistance from the client allows the joints to increase their range without pain. Now that I am the mom of a young child, I can understand in a new way the challenges faced by pregnant women and new moms. Pregnancy puts an incredible strain on a woman's body...asking it to change and adapt in endless ways. Most pregnancy massages are a side-lying version of Swedish Massage that are careful not to do harm to pregnant ladies. I'm not satisfied with this approach! No one needs structural work more than a pregnant woman. I offer targeted techniques to help rebalance ever-changing bodies allowing the mom-to-be to both relax for the 75 minute session as well as to be pain free for days and weeks after. Make massage a part of your pregnancy journey! (I did - I received massage and chiropractic regularly throughout my pregnancy, and at 39 weeks I was pain-free and dancing joyfully at the Kirkwood Spring Fling!) You will not regret it. Kids need bodywork too! I love to work with children of all ages. Cranio--sacral therapy is appropriate for even young babies. I can work with your child's sports injury, scoliosis, growing pains, as well as sleep troubles, and problems with eating. Give me a call for more information about the specific ways that I work with children. Intuitively guided energy balancing techniques are a part of every session. I have been studying energy and it's effects since 2001. Energy is the basis of everything in the universe. At the very base of our molecular structure, when you look at the smallest particles of our very being, you find fast moving bundles of energy. This energy responds to our intention. Our emotions are energy as well as our bodies. I am able to sense energy & emotion that is held in the tissues of the body and work with them directly to help bring balance to the whole system. Like all structures in the body, the energy must be able to move and flow in an unrestricted way for us to be able to experience true health and ease in our bodies. Working with the energies directly can relax the body and help release physical and emotional restrictions as well.